Fairlands Valley Spartans finished second on the night as both men’s and women’s teams managed to finish in front of Bishops Stortford. The result moved the Spartans up to second spot after the final scoring race of the season to secure promotion back to Division 1 for next season. Both teams finished third after the four races, but crucially the women were three points ahead of Bishops Stortford in fourth, while the men were two points behind Stortford. Congratulations to the 76 Spartans that ran on the night for a massive effort. 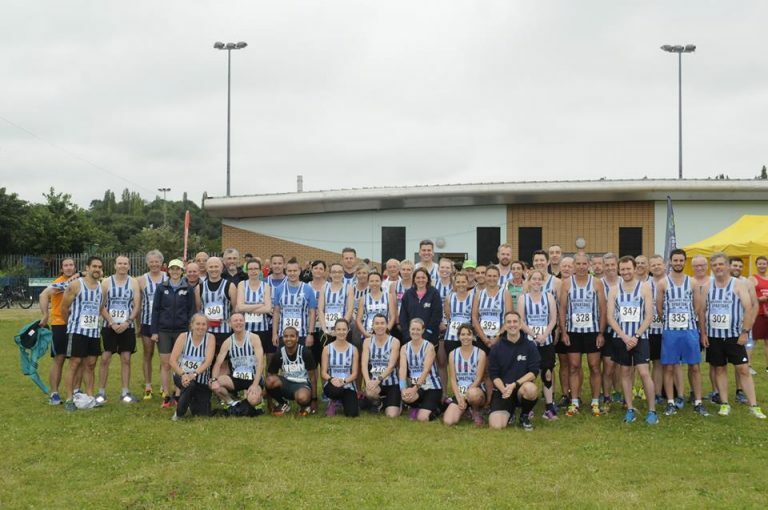 Also to NHRR who again won the men’s and women’s races on the night and are confirmed as Division 2 champions. Congratulations too to Harpenden Arrows and Stevenage Striders who are promoted from Division 3 to Division 2 for next season. With the 1st and 2nd placed V40 men over the four races both picking up ‘Open’ medals, Grant Ramsay and Simon Jackson will be collecting 1st and 2nd V40 awards, Brian White wins 1st V60 and Carol Paul 2nd V55, whilst just outside of the winners were Claire Emmerson 4th V45, Sharon Crowley 4th V55 and Paul Holgate 4th V60. Nuala Robinson would have picked up an award had she not had to miss a race for her honeymoon! Well done to all those who have picked up individual awards or gone close, and indeed to all Spartans who ran, helped or supported across the four races, all contributing to the promotion on the last day.